Your Immune System : A friend or a foe? Written by EpiPredict PhD fellow, Anchal Nigam (Epiontis, DE), together with EpiPredict Partner Organisation Science Matters. The EpiPredict consortium receives funding from the EU Horizon 2020 program under Marie Sklodowska-Curie grant agreement no. 642691. It is difficult to recognize an enemy in disguise and especially when the enemy is hidden amongst friends. Nevertheless, the human body has to deal with such scenarios. Our body is invaded by millions of pathogens* such as bacteria, viruses, toxins and sometimes suspicious growth of cells (for further explantion see the glossary below). Luckily our bodies have developed a sophisticated immune system to deal with such invasions. The immune system is a well-organized battalion of soldiers, comprising of cells that circulate throughout the body, reaching every organ. The cells of the immune system can be divided into two classes. One class of cells is constantly on the lookout for invaders and skeptically growing cells. When the enemies are recognized, they are eliminated or their activity is neutralized. We call these immune cells the “protectors” of the body. Examples of “protector” immune cells are effector T and B lymphocytes*, dendritic cells*, natural killer cells*. However, the protectors sometimes lack the ability to differentiate between the ‘good’ and the ‘bad’ cells. Therefore, the activity of these protector cells need to be monitored. Just to prevent them from attacking the good cells, which might lead to a dangerous condition called autoimmunity. The second class of immune cells is also known as “immune regulators”. Like the name suggests, these cells regulate the development and the activity of the protectors. 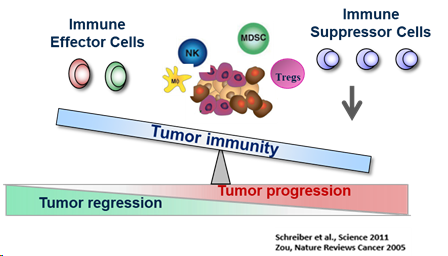 Some examples of these type of cells are Regulatory T cells(Tregs)*, Myeloid-derived suppressor cells (MDSC)*. In normal conditions, nature maintains the cells of both classes of the immune system in a balance just like a see-saw (figure below). The protector cells recognize as a team any kind of enemy and attack it, while on the other side the regulatory cells balances the number of protector cells to prevent them from attacking the good cells. However sometimes the number of regulatory cells increase drastically due to chemicals secreted by some developing tumor cells or pathogens. As a consequence the regulatory cells outweigh the protector cells and thereby disturb the balance. The body is now less protected from invasions, because the excess of regulatory cells prevent too many protector cells to perform their function. This paves the way for bad cells to grow without inhibition. We could say that these regulatory cells turned into foes. This situation gives a tumor an ideal environment to escape the immune supervision. Subsequently the tumor will grow and spread (metastasis*) to attack other organs. Figure: “It is all about balance”. In a “balance” condition, the protectors are on the lookout of any harm causing agent, and the regulators maintain the levels of protectors . In this figure, the balance has shifted towards regulators. Increase of regulators results in outweigh of regulators over protectors. This would give a good chance for the naive tumor to grow, develop and metastasize. Many clinical and laboratory studies have suggested that an increased number of regulatory immune cells might be a cause of tumor growth and metastasis of many cancers such as lung, pancreas, colon (Jiang Y et.al., 2015, Turbachova et.al., 2013, Liu et.al., 2018). The signature of high levels of immune regulatory cells have also been reported in recurrence of the tumor* (Bense et.al., 2017, A. Hendel, 2018). In these cases, the cells from women with recurrent breast cancer had a much weaker immune response compared to the cells of women whose breast cancer had not recurred. The protector immune cells along with the help of anti-tumor drugs once fought against the growing cancer cells and was successful to kept it at a bay. Unfortunately after 5–10 years of treatment it was unable to mount the attack against the recurrent tumor. The thinking is that the patient’s protector cells somehow become exhausted or stop responding. Why and how this occurs is still unknown. In our project called EpiPredict, we try to understand why the protector cells stop working in this group of patients before they relapse. For that we are applying very specific epigenetic technology* to count systematic changes in the make-up of the immune cells from both types (protector & regulator) in patient samples. The changes of both classes are compared to healthy cells to understand the nature of the tumor and to predict the risk of relapse. This would be a major advancement in the field of diagnosis of breast cancer and would help the clinicians to provide the patients with appropriate treatment. The knowledge of immune cell regulation has also been an inspiration for many scientists to develop treatment against tumors. For example to reduce the excess of regulators or to stimulate the protectors to fight the growing tumor. Such therapies are called as cancer immunotherapy. Notably, this year the Nobel Prize in Physiology and Medicine was awarded to the discovery of cancer therapy by inhibition of negative immune regulation. This involved the finding a peculiar composition of protector cells by the two scientists James P. Alisson and Tasuku Honjo. They found that the cells were presenting two proteins CTLA-4 and PD-1, which prevented their antitumor activity. Imagine two additional elements attached to the cells that stops their ability to attack a tumor. This research led to development of drugs blocking the additional CTLA-4 and PD-1 pieces, which empowered the immune action against the tumor. Immune cells might be the biggest fighters in the body to protect you, but they can turn into foes. How and why they turn is often a mystery. Knowledge about these cells help us to understand more and more about their involvement in cancer. And in some cases this has led to the development of diagnostics and therapies which is a bright light cutting through the grey clouds of cancer. *Pathogen: They are the microorganisms which have an ability to cause disease. *Cancer: It is a disease, in which cells starts multiplying in number and growing unregulated. The cells can invade other organs and also spread to distant organs. *Tumor: It is cancer which occurs in solid tissues like organs, bone or muscle. *Metastasis: It is the phenomenon where cancer cells invade other organs by growing blood vessels and spread to distant organs via blood. As this stage the tumor is said to be malignant and is a danger to the body. *T lymphocyte (a.k.a T cells): They are a type of white blood cells which are an important part of the “protector” class of the immune system. They either secrete chemicals to kill foreign harmful elements in the body or assist in killing them. They create a memory of an invasion that remembers the intruder and is prepared at the time of re-invasion. *B Lymphocytes (a.k.a B cells): They are a type of white blood cells which are an important part of the “protector” class of the immune system. With the help of T cells, they recognize a particular protein called an antigen, present on the foreign intruder and attacks them by secreting a protein called an antibody which is specific for that particular antigen. They also form memory cells that remember the same pathogen for faster antibody production in future infections. *Natural Killer Cells: They are a type of white blood cells, which provide rapid immune attack on a cell invaded by virus or against tumors. They have a self-ability to recognize cells that are in trouble. *Dendritic Cells: They are a class of accessory cells also known as antigen presenting cells and they help the T cells and B cells to recognize the antigen protein present on the invading pathogen. *Regulatory T cells (Tregs) : They are a type T cells which have a specialised function to control and regulate the T cells activity and prevent them to attack the “good cells”. They have the power to suppress the growth of T cells or even help them die. They belong to class of “regulators”. *Myeloid derived suppressor cells (MDSC) : Like Tregs, they also have a function to control and regulate the activity of “protector cells” . They help Tregs in their task. They belong to class of “regulators”. *Recurrence of tumor: A recurrence of tumor occurs when the cancer comes back after treatment. This can happen weeks, months, or even many years after the original cancer was treated. *Stage of tumor: It describes where a cancer is located, if or where the cancer cells have spread, and whether the cancer has affected other parts of the body. This is important information for clinicians to know the extent to which the cancer has infected the body. *Epigenetics : This is the study of changes upon the genetic code (DNA), an extra layer of code. This layer could be proteins which wrap around DNA thereby blocking certain regions of DNA or a chemical change on certain component of DNA. These extra parts on the DNA can influence its function; they are very stable, non-volatile and are hereditary in nature. In one of the previous blogs, “Introduction to Epigenetics” written by fellows in our project consortium, you can find more information about this topic. *Chemo and radio therapy : They are chemicals or radiations given independently or in combination to a cancer patient to kill the cancer cells. They are widely practiced technique help in survival against cancer but also have side-effects. · Turbachova et al. Epigenetics. 2013;8(11):1226–1235. The cellular ratio of immune tolerance (ImmunoCRIT) is a definite marker for aggressiveness of solid tumors and may explain tumor dissemination patterns. · Jiang Y. et.al. Cell Death Dis. 2015T-cell exhaustion in the tumor microenvironment. · Liu Y et. al. Cancer Immunol Immunother. 2018 Aug;67(8):1181–1195. Targeting myeloid-derived suppressor cells for cancer immunotherapy. · Nielsen et al. Clin Cancer Res.2010;16(21):5222–5232.A comparison of PAM50 intrinsic subtyping with immunohistochemistry and clinical prognostic factors in tamoxifen-treated estrogen receptor-positive breast cancer. · Bense et al. J Natl Cancer Inst. 2017;109(1). Relevance of tumor infiltrating immune cell composition and functionality for disease outcome in breast cancer. · Pitt et. al. Annals of Oncology, 1 August 2016, Volume 27, Issue 8, Targeting the tumor microenvironment: removing obstruction to anticancer immune responses and immunotherapy. · Nesrine Mejri et.al., Ther Adv Med Oncol. 2015 May; 7(3): 144–152 Relapse profile of early breast cancer according to immunohistochemical subtypes: guidance for patient’s follow up?